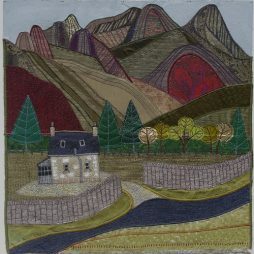 Debbie grew up in Lochaber and graduated from Glasgow School of Art (Embroidered and Woven Textile Department) in 1992. She worked as a designer for a number of years in both the textiles and outdoor clothing sectors. 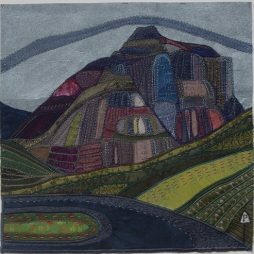 Following the arrival of her young family she now works as a textile artist producing work which is mainly mixed media / textile based. 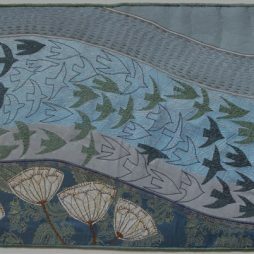 She uses a combination of collage, with paper, textiles, found objects, paint, metal and stitch (both hand and machine) to create image with rich colour and texture. 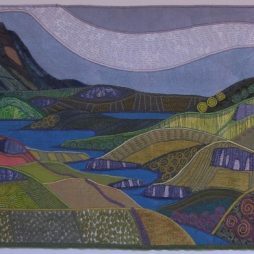 The final works depict the scenery of the Highlands of Scotland in which she lives. 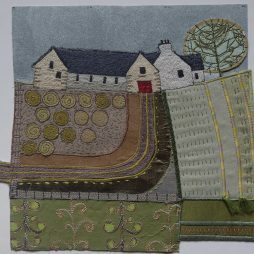 “Inspiration for my work is taken from the Highlands of Scotland. This covers both the area of Caithness where I live all the way across to the West Coast of Scotland where I grew up. In particular interest is the impact man has had on this landscape. The way in which a house, planted trees or farmland can shape scenery in a quirky way. The colour used is often, though not always, vibrant and pattern is used in repeat to create balance.